A - ADORABLE - Lily can definitely be this. She makes the more adorable face when she wants something and looks up at me and says "please mummy". B - BOISTEROUS - Sometimes I just don't know where she gets the energy from but sometimes she runs rings around me and finds it hilarious. C - CUDDLY - Lily loves a good cuddle. Sometimes a little to much and she won't let me stop cuddling her for 2 seconds. D - DISASTROUS - Lily has been a little clumsy lately and causing all sorts of mini disasters. Breaking things, knocking her potty of fresh wee all over, and falling over and being so close to really hurting herself. E - ENERGETIC - A little like how boisterous she is, I just don't know where she gets her energy from but she doesn't nap any more and just keeps going and going. F - FUNNY - Lily does the funniest little things and says the funniest. She is always dressing up and telling me how much she likes everything. Even her daddies boxers she told me she loved while we did the laundry. 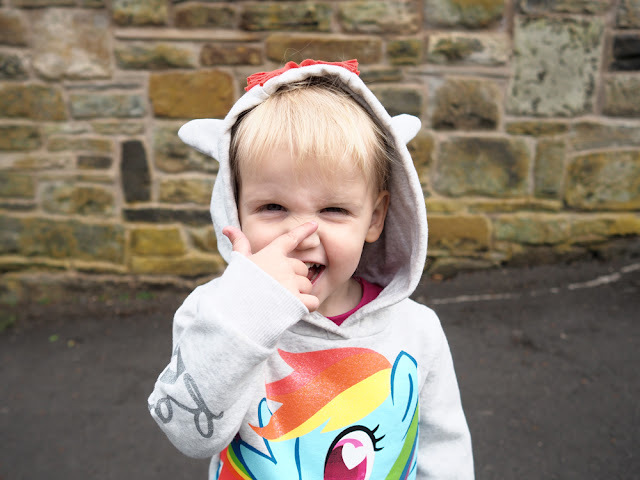 G - GROSS - Why do children insist on picking there nose and pulling out a great big bogie and showing you it? H - HAPPY - I just love it when Lily is in a happy mood. Playing nicely with her teddies and making up conversations as she smiles away. I - IRRESISTIBLE - I just can't help but pick her up and give her the biggest kisses sometimes! J - JUMPY - Lily is so easy to make jump, she is frightened of her own shadow sometimes. She also loves to jump on the bed. K - KIND - Lily always shares and if someone is upset she will give them a hug and make sure they are okay. L - LOVING - Lily is so loveable. She always strokes the cats and when she is around other babies she will look after them by giving them a blanket or teddies. M - MONSTER - Oh yes, Lily can definitely be a little monster. She knows how to throw a good tantrum and also knows how to totally ignore everything you are saying. N - NOISY - Hand me the headphones. Lily sometimes runs around the house screaming just for fun. I have had guests cringe at how high pitched her scream can be. O - OH DEAR - One of the things Lily says a lot! P - POLITE - Lily has really good manners, always says please and thank you and sometimes will say sorry. Q - QUEEN - I swear this little lady thinks she is the queen. The way she sometimes orders me around like she thinks she is in charge. R - REFUSING - Lily's favourite word is NO! She really does like to try her best to refuse to do things, like have a bath and go to bed, eat all her dinner. S - STUBBORN - She wants things her way or no way generally, and just like I said for R, flat out refuses to do things. Even when they are for her own good. T - TALKATIVE - Now that Lily knows how to talk, she doesn't ever stop. Sometimes we can't understand what she is going on about, especially when talking to herself or her toys and teddies but most the time we can have a good conversation with her. U - UNDERSTANDS - Lily is really good at understanding things now. Most things I explain to her she gets and then remembers how to do later on. V - VANITY - Lily is always looking at herself in the mirror, she is always dressing up lately and wanting to wear her jewellery. I have also caught her trying on my underwear and high heels. Oh dear haha. W - WHINEY - Like does love to whinge and whine. Usually over nothing. She is the worst for it when tired. X - CROSS - As there are no words beginning with X that I can think off i'm saying cross as thats definitely what Lily can get like. She will fold her arms at you and say NO! Z - ZOOM - Lily zooms around the house like she is fuelled up on red bull. What words describe your child? One thing I love to see the children do is :- Reciprocate. Sounds like your Lily may be beginning to do that by being K :- Kind, and it seems she is developing Empathy. Lovely when children and adults behave and interact with Kindness, Caring, Empathy etc. As we share this planet with others, and we benefit from appropriate social interaction. This is so cute, such a lovely way to think about your child. What a gorgeous post, both you and Lily will love looking back on this. It will be great to see how your alphabet description of her changes over the years.